Blake (Hogan), during one of his regular paintballing jaunts with his personal staff, gets mistaken for a terrorist by the local sheriff (Clint Howard) and disguises himself as Santa Claus in a nearby shopping mall. 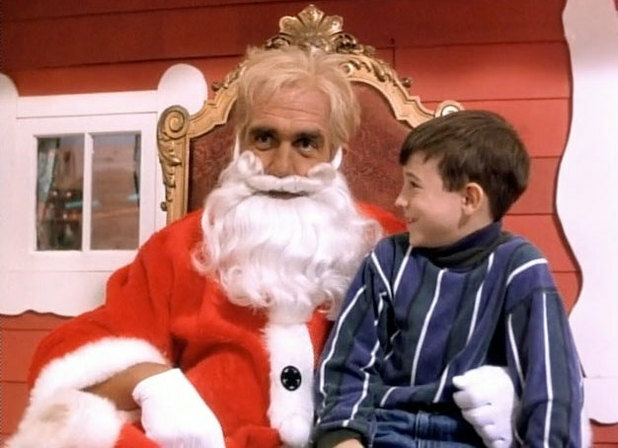 After a bump on the noggin he believes he actually is Santa Claus, and holes up in a local orphanage with his elf partner (Don Stark). After drinking milk and eating cookies with the three orphans (one played by young Mila Kunis), an evil gang of scientists led by Ebner Frost (Ed Begley Jr.) tries to take the orphanage by force in order to acquire the magic exploding crystals hidden underneath. Blake punches these guys until everyone learns the true meaning of Christmas. Produced by The Wolf of Wall Street's own Jordan Belfort! For some reason the only image on the IMDb page is this autographed photo of the Hulkster with Mila Kunis giving a thumbs up. Clint Howard is also in this movie, making it his second appearance on the podcast this month. For more on Hulk Hogan, read Chris's review of 3 Ninjas: High Noon at Mega Mountain. Though we tried really hard to find a way to pay for this, it was to no avail. You can, however, watch it in its entirety on YouTube.